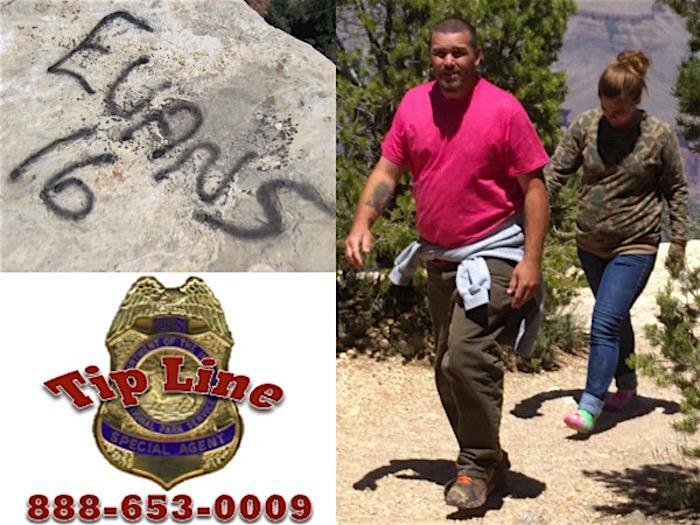 ST. GEORGE — National Park Service officials are looking for information about two people who may have vandalized rocks in Grand Canyon National Park. The National Park Service Investigative Services Branch and U.S. Park Rangers began investigating after a man and woman allegedly spray-painted graffiti on a rock near the Yavapai Geology Museum. On May 22, a visitor at the South Rim of the park observed the man and a woman spray-painting the phrase “Evans 16” in black on a rock, according to a media statement issued Monday by the park’s Investigative Services. The visitor took photos of the people and the graffiti, but the couple left before park rangers could contact them. Defacing a natural feature is a federal offense that carries jail time and fines. Anyone who recognizes the man and woman shown in the photo included in this report is encouraged to contact the National Park Service by calling its tip line at 888-653-0009; sending an online tip; or sending an email or a message on Facebook. All graffiti artists deserve painful death.